Rec. Albany Mus. 1: 93 1903. 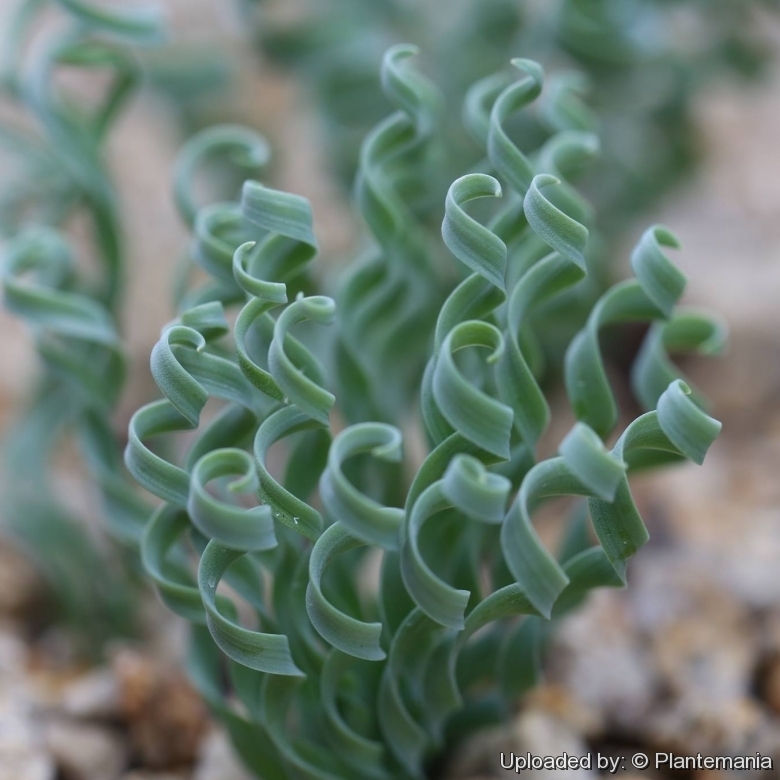 Origin and Habitat: Albuca concordiana grows over large parts southern Namibia through the north-west Cape to the Karoo and the south-east Cape in South Africa. Habitat and ecology: This small summer dormant bulb comes from the winter rainfall regions of southwestern Africa where it grows on stony flats among various kinds of scrub in hot, dry conditions. The species is not considered threatened in its habitat early in the twenty first century. Description: Albuca concordiana (syn. Ornithogalum concordianum) is a small geophytic perennial plant that reaches 20 cm in height when in flower, and slowly offseting to form clumps. It is distinguished by corkscrew-coiled leaves. When dormancy begins, the inflorescence appears and soon bursts open with fragrant flowers with bright yellow petals with a broad green midrib coming from the side of the flower stalk. Derivation of specific name: The epithet concordiana refers to Concordia, South Africa, where the type specimen was collected. Bulb: Small spherical, tunics white membranous above near the neck. Leaves: 5-7,5 cm long, 3-4 mm wide, blue-grey, strap-like, flat, finely longitudinally channelled, glabrous and not sticky. The leaves emerge before the flowers in early winter from the ground in a corkscrew-shape, coiling in a rather dramatic way, and are often withered at bloom-time. Inflorescence: Raceme 8-10-flowered, 7.5 cm long, the pedicels are erect-spreading or (rarely) nodding, 8-12 mm long, bracts ovate-lanceolate. Flowers: The flowers are fragrant and face outwards from the stalk and usually don’t nod. Perianth 12 mm long, segments oblong-spathulate white to brownish (mostly yellow), with a broad green keel along the outside of the tepals. Stamens all fertile. Style subulate 6-8 mm long. Blooming season: It flowers August through September (late winter to early spring). 5) Vlok, J. and Schutte-Vlok, A.L. “Plants of the Klein Karoo”. Umdaus Press, Hatfield 2010. 6) Klopper, R. & Victor, J.E. 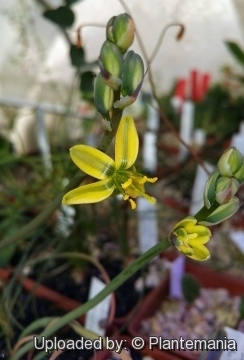 “Albuca concordiana Baker. National Assessment”: Red List of South African Plants version 2015.1. Accessed on 2017/01/24 2005. 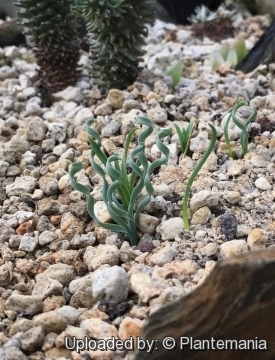 Cultivation and Propagation: Albuca concordiana comes from the winter rainfall regions of south-western Africa, producing its miniature whirlwinds of leaves in early winter. The leaves usually curl better if given good light. It would probably look even better in a hot dry environment. It is one of the most difficult members to cultivate successfully over an extended period. It is a winter-growing and summer-dormant species that needs to be kept almost dry during its dormancy as the bulbs is disposed to dwindle and rot. Its summer rest must be absolute and does not initiate new foliage until the cooling effects of autumn. This plant may or may not have foliage in the heat of the summer. If it does have foliage, during the hottest part of summer, the foliage and plant may look ratty but as long as the bulb is firm the plant is in good health and it will improve in appearance once new foliage initiates in the autumn. A great plant for the southern rock garden as well. Exposure: Prefers some direct sun but will scorch in hot, sunny, dry locations. Waterings: Water sparingly when growing and a little care, it is a definite water-wise species. 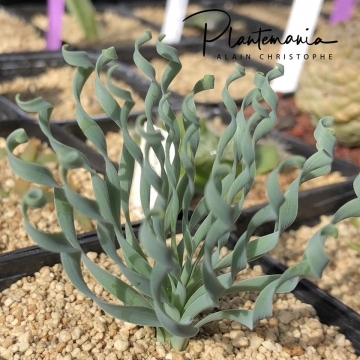 The curling of the leaf tips is largely dependent on weather conditions. Cool dry conditions encourage the leaf tips to curl, while warm most conditions tends to encourage erect, straight, uncurled leaf tips. When flowers begin to appear, water should be withheld in order to avoid rot. If the plants are allowed to dry too much, they will go dormant. Soil: Coarse river sand or gravel must be incorporated into the growing medium for excellent drainage. It is often suggested to add gravel mulch on the top of the soil, so when the bulbs are dormant the pot remains interesting to view. Hardiness: In the winter plants can be left outside because the spirally foliage is reliably hardy to – 7° C. In colder areas the plants should be protected in the greenhouse. Propagation: Division, seeds. Seed germinate easily. It is best to propagate seeds in the autumn through winter in a mixture of moist peat and perlite. Cover the pot and plant with a plastic bag secured by a rubber band to prevent the moisture from escaping. Place in indirect sunlight or under a fluorescent light. Repot in its regular mix after it has been growing for a while. After dividing plant or removing offsets, pot it in its regular potting mix.